What percentage of e-automate are you using? Once you've completed the initial conversion/implementation, it's difficult to know if you're taking advantage of all the money-making and cost-saving power that your e-automate solution offers. Our Customer Account Managers are here for you! This team is devoted to helping you understand best practices and how to optimize your use of e-automate to improve your business. Once you have gone live on e-automate, the success of your business is their primary concern. Customer Account Managers provide the one-on-one attention and focus to make sure you are receiving the desired results. Although they don't assist with technical questions, their job is to make sure you have the right tools to achieve your goals and to meet your business' day-to-day challenges head-on! This industry leading team consists of Jeff Neeley, Tanner Phillips, Shaun Garff and Dan Itri. Each manager is assigned to a demographic region to make sure that all e-automate dealers are utilizing their software to not only survive, but to strengthen the dealers' ability to save their own customers money in this troubling economy. Much of our Customer Account Team's expertise comes from consistently being in contact with our dealers and receiving large amounts of feedback. They hear success stories and assist with the concerns of each company. This provides them with a unique perspective on e-automate, what has been done to advance companies in your similar situation and what can be done to prevent business problems. I invite you to call 877-dgsolutions (877-347-6588) or email sales@digitalgateway.com today and learn how your Customer Account Manager can help you get the most value out of e-automate for your dealership! Whether it's a question about Remote Tech or tips on how to increase your sales, they are here to assist you. In many ways, they are your personal DGI employee, helping you when help is needed. Digital Gateway is dedicated to each dealer's success and relies on the Customer Account Managers to help maintain this level of communication and assistance. Want to streamline your entire sales force? Digital Gateway's newest add-on product, Digital Quote Manager (DQM), is a powerful tool for both sales managers and their reps. It allows managers to define specific equipment and accessory configurations, out-cost assignments, lease options, service rates, and sales rep assignments. Sales reps can create sales quotes in a fraction of the time using correct equipment configurations. But in order to do this, you must have the aspects defined and rules set up which will be difficult if you don't have the right person from your company assigned to set up configurations, or have your e-automate items prepared. A few users struggled during the beta phase of DQM because they didn't have someone who was familiar with the equipment or inventory item setup trying to build the configurations. It presented difficulties that could have easily been avoided. Below are a few tips to help you get started with the DQM set up. Ideally you should have someone who is familiar with the equipment items you sell and how those items are set up in your e-automate system. This may be a Sales/Lease Administrator, Purchasing Agent or Inventory Manager. 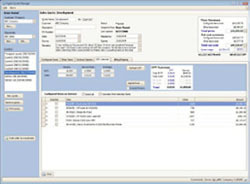 Review the related item set up in your e-automate system, typically most dealers have already associated the appropriate toner items on the related items tab. In addition you can streamline your DQM configuration set up if you also add the appropriate accessory items to the related items tab. This will save you a step by bringing over all of the related items with the host model when building the configuration. Not all configurations have to be built in order for you to start using DQM. We suggest that you build your most important or commonly sold configurations first. As soon as a configuration has been built and activated, a sales rep can start creating quotes based on that configuration. DQM is a powerful new product we are excited to introduce as the latest addition the e-automate add-on family. The original idea for this product came from the EUG and our developers. We feel that this product will not only be beneficial to the sales aspect of our dealers' organizations but will also help streamline the administrative end of things as well. Digital Gateway's Partner Integration Platform (PIP) allows 3rd party partners to be integrated with your e-automate software. For example, using FMAudit and the integration they support via PIP allows you to have meter information submitted real-time from your customer sites for meter billing. Using Red Cheetah integration that is enabled via PIP allows you to have an e-commerce site that places customer sales orders directly to your e-automate system. So why should you use our suggested partners? We have at least 2 partners in all categories of integration. These categories include meters, manufacturers, CRM/SFA, inventory/taxes, leasing/payroll and e-commerce. This provides dealers a choice of the top industry partners who they have requested and who we believe to be the best-of-class. Integrations bring healthy competition between partners and our dealers. We work closely with each partner and combined with suggestions from the EUG, push them harder to make better integrations for out dealers. The better the integration, the more our dealers will use their offerings and the more success you'll find from utilizing the relationships between e-automate and their 3rd party partners. There is strength in numbers and these partners know that e-automate integrations have the potential of being adopted by over 1000 dealers. Join our efforts by using the approved vendor integrations. It will provide you with the advantage of having 3rd party integrations that work seamlessly with your e-automate system. If you have any suggestions for other e-automate integrations, drive it through the e-automate Users Group (EUG) and steering committees. For more information about how this can be done, contact EUG chairman Jeff Taylor at jtaylor@isionline.net. Partners are listed on our website: http://www.digitalgateway.com/partner-home.html. Many e-automate dealers have questions about Red Cheetah and how we can help their business. As CEO of Red Cheetah, I would like to personally take the time to answer your questions. Red Cheetah is a full ecommerce and complete wholesaler enabled ordering system. Founded in 2002 with over 500 signed dealers to date, Red Cheetah is designed exclusively for the Office Products and Technology Consumables Industry. In addition, Digital Gateway and Red Cheetah formed an integration partnership in 2006 allowing e-automate dealers to extend their offerings. Why does it matter to e-automate dealers? e-automate dealers using Red Cheetah's ecommerce platform increase their sales by offering office supplies, toner and imaging products. Orders are electronically fulfilled through leading wholesalers such as Supplies Network, SP Richards and United Stationers. Synnex will be added in early 2009. How easy is it to start an office supply division for a typical e-automate dealer? The national office supply wholesalers integrated with Red Cheetah do all of the heavy lifting with order fulfillment and delivery. Due to the sophistication of the item files provided by the wholesalers, customers are able to easily search, browse or receive recommendations for their office supply purchases when using Red Cheetah. Because you don't have to be an expert to sell office supplies, all that remains is invoicing and coordinating customer returns. How many e-automate dealers are currently using Red Cheetah? Red Cheetah has earned the trust of 10 e-automate dealers who are either 'live' on the system or are currently in training. What do actual e-automate dealers using Red Cheetah say about the experience? "Compared to the website provider we had (Britannia), Red Cheetah is awesome. Red Cheetah made our life much easier. Orders are uploaded directly into e-automate with no manual entry needed. Prices are correct because Red Cheetah has my prices right from SP Richards. As far as my customers - they love it. Pictures and descriptions of the office supply items help sell themselves." Cow bells, air horns and other noise makers were used by Digital Gateway (DGI) employees when our ranking was announced at the Utah Business Magazine's Fast 50 award banquet. The Fast 50 highlighted the 50 fastest growing companies in the state of Utah and DGI was #31. Other awards such as the Inc 5000, Utah 100 and Best of State demonstrated DGI's external excellence for business performance in 2008. This type of recognition is nice but our true satisfaction comes from the intrinsic award of knowing Digital Gateway has made a positive impact for our customers and are helping their businesses succeed. "The two things we like most about RC is the ease of operation with the process of transmitting to fulfilling orders and how the RG/DG integration is going to help us to control our inventory. The integration has streamlined our office procedures helping us to be more efficient. Finally, the technical support staff has been very supportive when helping with resolving problems as I had them." I invite you to contact us today to learn more about how you can increase your top and bottom lines with Red Cheetah. Our affordable monthly pricing is available at http://redcheetah.com/pricing.php and other information can be found at our website http://redcheetah.com. Feel free to call us at 866.878.9257 or email sales@redcheetah.com. We look forward to talking to you soon. Happy Selling. "Always improving" is really a hallmark for the culture at DGI. We are always improving our products, processes, and people's ability to help our dealers be more successful. Besides the additional product enhancements our dealers have enjoyed this year, we also have made some great strides in improving many aspects of our company to not only help our dealers directly, but to also make sure we continually improve our efficiency to stay active and relevant for our dealers in the future. You may be asking, "So, what have we done for you lately?" Here are a few of the many improvements we made for you in 2008. - Moved the Advanced Essentials course online. This still provides the same great training and content of the previous class and yet saves our dealers time and money by eliminating the need to travel to Utah for this class. - Improved search functionality in STEPS (greater ability to search by exact phrase and also search by module). This has significantly improved our customers' ability to retrieve specific answers in an area of e-automate faster. Previously, there were too many result sets for the users to have to wade through to find the answer they were looking for. Are you getting all the value you can from STEPS? - Provided documentation for products online. Customers who have wanted to have a printed version of the documentation can now easily access a PDF version. This also allows more users to get to a version that they can print at anytime and write on when learning. - Added 4 new employees to our Support Team this year to help provide better response times for our customers. - Invested in the development of tools in Support that provide information on call status, length of time per call, call backs, response and resolution time, and warnings for calls getting close to violating their support agreements. - Support conducts training sessions at least once a week to tackle product usage questions, frequently asked questions by our customers, product overviews, and training on new products being released. This is also a great forum for the group to work together and tackle the tougher issues. - Set many DGI records this year in Support. On a day we received 138 calls, the most calls we've ever received in one day, we closed 159 calls that same day, which is the most calls we have ever closed!! - Added Krista Jensen to our Account Manager role in our conversion process this year. She acts as the main point of contact now for customers in the implementation queue before and 60 days after their first transaction date. - Improved Project Plans and communication processes so that new customers have a better understanding of their roles and responsibilities as well as the timing of key deliverables. A project management tool is also being tested and will be rolled out next year to help automate notifications of project status. - Joined with some industry consultants (Karen Wright, Teresa Armstrong, Carolyn Hackmann, and Jack Duncan) to help us fine tune our OMD conversion tools. We are now able to assess a customer's OMD database before a conversion to identify bad data and anomalies with the data prior to their conversion. We then are able to clean the data or help the customer clean their own data before the conversion process and provide for a more accurate and robust final database. - Conversion tools have been developed for SuperDos (old LaCrosse database), River Cities, and DDMS. These tools will help us extract and then translate this data faster and more accurately before we insert the data into e-automate. - Initiated the Dealer Success Academy (DSA). This is the "professional services" arm of Digital Gateway and will provide not only better ways to use e-automate, but also how to get better decision making information out of e-automate. Jack Duncan's SMU class was the first class we started with this year. - Additional accounting, inventory, operational, contract optimization, and overall e-automate optimization classes and coaching sessions next year. It is imperative for our dealers and employees that we continually look for ways to improve and increase our operational effectiveness and efficiency. As we improve our people, processes, tools, and products for our customers, we become a healthier organization and ensure our longevity for our customers. We confidently look to the future and are excited for what 2009 will hold in store for all of us. Digital Gateway reminds all e-automate dealers about the importance of data backup. Data disasters come in many different forms such as a roof leak in the server room, a power outage, theft, or even a natural disaster such as an earthquake or hurricane. Whatever the crisis may be, securing your business data is vital to your company's day-to-day activity. Our Customer Care department received about a dozen calls in 2008 from dealers who had corrupt data or experienced data loss which resulted in weeks or even years of erased data. In one case, even the backup tape was lost. But these are only the cases we know about, there maybe others who haven't realized that data loss has occurred. Set up a SQL maintenance plan using SQL Server Agent that schedules backups. Having a database backup is much better than just copying the data files as in most configurations a system backup cannot copy the mdf file (SQL data file) as it's currently in use by your SQL server. Manual backups can be done effectively in e-admin, if you don't have an automated backup process readily available to you this is a good alternative. Do a mock data recovery to insure your data is being backed up correctly and what is being backed up can actually be restored. Make copies of database backups files onto either a thumb drive or an off-site data server. In regards to hiring an online backup provider for your e-automate database needs we asked one such online backup provider, VaultLogix, what questions our customers need to be asking when considering their options. Shane Arnold, Vice-President of Marketing and Product Management for VaultLogix said, "Your data is your business. Choosing an online backup provider can be a daunting task because there are so many companies out there. Before entrusting your valuable data to any company, take time to do the research. VaultLogix would like to share 4 questions to assist you in this important decision." Does the provider focus on business clients? Business-class backup providers offer a much higher level of support and redundancy than backup companies that target home users. Businesses cannot afford a protracted interruption in service, and business-class backup providers are geared to get a company's data restored and the business returned to normal operations as quickly as possible. Does the provider conduct annual SAS 70 Type II audits? These audits provide independent verification that the service provider has effective controls in place. The controls audited include physical security, environmental systems, operational processes, organizational controls, and service delivery. Is there a cap on upload speed? Many low-end providers offer "unlimited" backup at a very low price, but restrict the upload speed so that the backups only work efficiently for very small data volumes. Look for a provider that offers unrestricted Internet pipe for uploads and downloads. This will enable fast backups and speedy restores. Is it easy to access a knowledgeable support technician when you have a problem? This is simple to determine - just call their support line. If you can't easily find a telephone number to call, changes are you won't find it easy to contact someone when you really need support. If you find a telephone number, call it and see how long it takes before you actually speak with a technician. VaultLogix is one of the many companies available to provide online data backup. For 3rd party data companies, it's important that e-automate dealers do their own company. Each dealership is different but the importance of data backup is always the same. With this being the start of a new year it is the best time to consider what data backup option is best for you and your company. Don't let the only time you think about data loss be after it's lost. You can't control what happens in the future but you can control what steps are taken to handle a data crisis situation. Protecting your data protects your business. For more details about e-automate data backup, email customercare@digitalgateway.com or call Digital Gateway at 866-342-8392. VaultLogix can be reached at 877-VAULTLOGIX or email sales@vaultlogix.com. You can also visit their website at dataprotection.com. Oftentimes it's helpful to know which e-automate user created a new record or entered a transaction as well as the exact date it was done. This type of information can be seen in e-views. There is an "Entered By" and "Entered Date" column on almost every e-view. On some records there is even an "Updated By" and "Update Date". You can create filters for these to see transactions that were entered later than the date that is actually on the transaction. Or see when the last time the record was changed. These columns are usually at the very end of the view. By using bulk updates you can update many records at once instead of editing them manually one at a time. Be sure to check Bulk Updates first to see if the option you want to change is listed so that you can save hours of time versus doing that change by hand. Using the Quick Search is how you can create the specific list of records that need the update. Bulk Updates can be found under the Tools Menu in the e-automate. There are many more bulk updates added in e-automate 7.5. With the use of "Alternate Reports Path", your reports can be shared over the network for e-automate instead of having to have a copy on each workstation, be sure you update the reports folder on your network when you upgrade to a newer version of e-automate as the install will only update each workstation, not your network reports. In most cases running a previous version on a report on a newer version of e-automate will result in errors. To update the reports when using "Alternate Reports Path" just copy the new reports from an updated workstation to your network reports folder. The Digital Gateway development team would like to announce the implementation of over 40 enhancement requests from our recent e-automate User Group (EUG) meeting into our e-automate 7.5 release. Our development team places enhancement requests into several categories to identify their relative size and complexity (i.e. sand, gravel, rock, boulder, mountain, etc.) with 'sand' being the least complex. During the EUG department break-out sessions, face to face conversations and the wish list discussion, we accumulated a list of enhancement requests. Following the meeting we reviewed this list and decided it would be in the best interests of our customers to respond immediately to as many requests as possible, despite the fact that we were deep into our release process for e-automate 7.5. That was the beginning of "Operation Sandstorm," a two week effort to include as many of the aforementioned "sand" enhancement requests as possible in the e-automate 7.5 release. We value our customers' feedback and attribute much of our success to listening and responding to their requests. This feedback makes up a significant portion of our development roadmap as we go forward. We sincerely appreciate all the customers that come to the EUG meetings and want to thank them for sharing their ideas and suggestions... we're always listening! At the end of my last article, I said my next topic would be exploring what kind of content you need to have on your website. But to help organize the thoughts I wanted to first address this topic of marketing to CFOs because they are the one making the financial decisions. In today's challenging economy, we are finding that CFOs are very open to talking about strategies to reduce overhead expenses- like Managed Print Services. If you know how they think and how to market to them, especially in your website, you'll find more success. Let me use managed print as an example. When it comes to marketing your Managed Print Services program, there are only a few people who need to know about your business. In the case of your Managed Print Services business, the targets you are after are not a secret. Your target is the top financial decision maker in companies with 50+ printers, or 50+ employees. The top financial decision marker in a company of this size is typically the Chief Financial Officer (CFO). If the company does not have a CFO, other similar positions could include: Vice President of Finance, Controller or Finance Manager. As we think about attacking this target market, the important question becomes: "What is important to a CFO?" What Makes a CFO Tick? While CEO's and Presidents tend to lean toward driving more revenue, CFO's are typically concerned about protecting the revenue that comes into the company. As such, they see themselves as the guardians of expenses. CFOs face a tremendous amount of pressure to control overhead expenses. With a competitive marketplace putting strains on gross profits, a company must control their overhead to be able to bring results to the bottom line. Add to that the growing costs as the impact of high energy costs ripples through the economy with the higher shipping, increased travel and overall inflation and you begin to realize that CFOs face a tremendous challenge. It is important to consider how CFOs go about reducing costs. They look for strategic initiatives to make a big-picture impact on the cost structure of their organization. Unlike the purchasing function that lives based on the lowest price, most CFOs realize that expense reduction goes beyond the lowest cost. Often thinking more strategically, CFOs consider the impact of a change on the total system. Following are a few ways that a CFO could think about cost reduction that go beyond just a lower price. The more vendors an organization has, the more costs they incur in managing vendor relationships and processing invoices. Vendor consolidation in a common strategy to streamline the accounts payable function. Your value proposition is a strong play into the vendor consolidation since you offer the best single source for printers and multifunction systems. The most expensive component of any business is human resources. Companies do not want to add people if they do not need to. A CFO will only want to approve a new position if it is directly related to the core functions of the company. If something is not related to the core functions of the company they will want to find a partner to outsource the work to. Most companies outsource non-core functions like janitorial services, delivery or benefits. A managed print services relationship allows them to outsource the management of output devices. This frees up their IT staff to focus on core initiatives and may keep them from needing to add more personnel in the IT department. Paper and digital documents are the key vehicles by which information flows through business processes. When you can streamline the flow of information you make a company's core processes more efficient. This automation results in lower costs. Working in the financial world, most CFOs realize the drag of outdated, paper-intensive processes. When you can show them how your HP solutions can help integrate paper into their workflow, you demonstrate your ability to help strategically reduce costs. A common saying by CFOs is "If it can't be measured, it can't be managed." When it comes to printing and copying, most companies have no control over usage. This becomes even more of a problem as color usage becomes more common. CFOs like the ability to monitor and manage expenses and will be open to color cost control strategies. While CFOs care about cost, they also care about risk. As you sell and market to CFOs, here are a few ways that you can bring risk-reduction into the conversation. If the company is publicly traded, they fall under the oversight of the Securities and Exchange Commission (SEC) and Sarbanes Oxley (SOX). Intended to curb corporate accounting scandals, SOX requires that CFOs personally sign off on their company's financial statements. They can be held personally liable for errors. This is driving companies to make sure they are keeping accurate records of each transaction. The scanning features on HP MFPs and the associated document capture solutions provide a critical component to bring this information into searchable archives. Similar to SOX compliance issues, most CFOs are audited by some external organization. Auditors are typically looking for information. When you can help a company create a searchable archive of their scanned paper information you help streamline the audit process and reduce the risk that information cannot be found. Information security is important to CFOs that realize the value of corporate secrets. While much attention is paid to network security, most organizations have no way to control what is printed or copied. Since most information thefts come through internal employees, this is a problem. You can help a CFO enhance the security of their information by providing a secure printing and copying environment. Businesses often lose lawsuits because they cannot produce information to substantiate their innocence. New Federal Rules of Civil Procedure (FRCP) also mandate that organizations be able to produce electronic records in a lawsuit. You can help a CFO reduce legal risks by creating an electronic document management system to store their critical information in a format that can be easily recalled during a lawsuit. In next month's issue, we will explore how to sell and market to the other core audience: Chief Information Officers (CIO) and other top-level IT staff. Darrel Amy (damy@prospectbuilder.net) is the President of ProspectBuilder.net, an outsourced marketing services firm dedicated to helping HP IPG resellers succeed. Services include: website design and content, sales collateral design, and a portfolio of direct marketing services. Learn more online at www.prospectbuilder.net. Service Dispatcher or Resource Coordinator? Today's Technical Service Department often has a Dispatcher(s) when what is actually needed is more of a Resource Coordinator (the Technicians are their resources), or maybe better described as a Field Service Coordinator. These people have a huge opportunity to impact the productivity and response times of the department as well as customer satisfaction. balancing service technicians' workloads to insure that some are not buried while others do not have enough to do; all with a smile on their face! Tough job? You bet! Maybe one of our industry's biggest unsung heroes (heroines) are our Service Dispatchers. As we look at the differences, we still see a person who receives and completes the administrative side of service calls, but how can we impact other areas of service? Let's look first at customer satisfaction. Since the person taking the call is the first person to notice things like recalls, excess service calls, or just a plain unhappy customer, they can also be the person who first alerts management of these issues. They are indeed our "Early Warning System". By using tools such as MS MapPoint, Dispatch Consoles and others, a Resource Coordinator can insure that service calls are assigned to the closest available Technician qualified to work on the equipment, therefore, reducing travel time. Consequently, the reduction of travel time increases available customer time raising productivity and lowering travel expenses at the same time. With the erratic nature of the cost of fuel these days, can we really afford to travel too far on service calls? Positive impact can be huge. While Service Technicians should be well aware of their calls and their commitments to get them completed, a Resource Coordinator should be aware of the "Big Picture" we all know as the field. A tech can call a Resource Coordinator and tell them that he needs two extra hours to do a PM call, or that they are getting caught up and could help a friend in need, or who is on vacation and needs their calls to be reassigned. Squeezing in installations or that extra hot emergency call is all part of the game for a Resource Coordinator. Maintaining a balanced workload among technicians can aid in lowering response times as well as insuring that technicians are able to complete prior call assignments due to reschedules etc. If we go to the time and trouble to overnight a part to solve a problem, but the technician does not have time to go back and put it in, we wasted our efforts and freight expense as well as lowered our customer satisfaction. A Resource Coordinator can carve a hole in a technician's day to complete this call while not losing track of emergency calls and their response times. Stop and think about it, your Resource Coordinator must exhibit the unique quality of being able to "Take a licking and still keep on ticking." Practically everyone who calls them is upset because something does not work. When was the last time someone called your service department to say that nothing was wrong? Resource Coordinators must reassure the customer with a smile in their voice that they "will handle it and all will be well soon". Complaints and chewing-outs must roll off them like the proverbial "water off a Duck's back." These traits can be hard to find. Making the transition from a dispatcher to a Resource Coordinator can pay big dividends in customer satisfaction, productivity, and lowered travel time and expenses. This often underappreciated role can make a big impact on their coworkers by helping balance workloads and just generally helping coordinate all the goings-on that there are in a service department. Reassuring customers with a smile as they place calls makes life easier for the technician who later comes face-to-face with them. While not everyone can do this job, the Resource Coordinator can go a long way towards making life easier for many people in your organization as well as your customers. Have you hugged your Resource Coordinator lately? Thank you to all who attended this year's annual EUG meeting that took place October 20-24, 2008 in downtown Salt Lake City. It was one of our best meetings yet. We had dealers come together from 42 states, 5 Canadian provinces, 3 Caribbean nations and many different industries to discuss topics involving our e-automate software. Digital Gateway also had their employees and executives participating in each day's events. EUG presenters gave helpful information on managed print services, Digital Quote Manager, commissions, Digital Task Force, e-agent, e-info, Logistics Console, contracts, Remote Tech, e-automate 7.5, and much more. We also had a EUG wii competition. 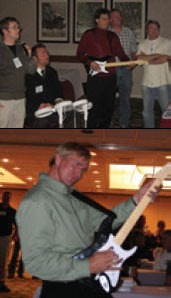 Both EUG members and DGI employees rocked out to Rock Band and bowled in wii Bowling. It was fun to participate by more entertaining to watch. Steering Committees were set up during this week and are now fully staffed and working on behalf of the EUG. The purpose of these committees is to gather input from the group as a whole and funnel enhancement requests to DGI's development team. Those with premium EUG memberships will still get the opportunity to vote on enhancements, but the Steering Committees will be responsible for filtering and organizing the items we vote on. Listen to your conscience. This is your chance to join and get involved in the future of your favorite software. 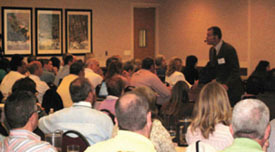 The EUG executive team has already begun discussions on the 2009 meeting, tentatively planned for September or October. We'd like to ask for your input on what discussion topics and breakout sessions you'd like to see at our next EUG. We are, after all, there for the benefit of those who attend the meeting. Most likely we will post surveys on the web site (http://eug.digitalgateway.com) to gather the group's input. For those still on the fence about joining the EUG and attending the meetings, let me give you a little known fact. A beta version of e-automate 7.5 was introduced at the meeting and was met with great reviews. DGI took notes during the discussion of new features and I'm proud to say that their development team incorporated over 40 of the features and changes discussed at the meeting in the final release of the project. Further enhancements from the meeting will come in Remote Tech and e-info releases. This is proof that attending the annual meeting is something you don't want to miss. Thanks to Chris Kenworthy and his team at DGI for getting these extra enhancements in the e-automate 7.5 release with such short notice. If you were unable to attend the October meeting in Salt Lake City, you can sign in to the EUG site (http://eug.digitalgateway.com) and view posts of each day's discussions in the Group Blogs/Community Blogs(EUG)/EUG Meetings area of the site. You can also download the PowerPoint presentations from the meeting. I'd like to thank each person who took time to post during the meeting. As chairman of the e-automate users group, I hope to see you at our next annual meeting and that you visit our website at http://eug.digitalgateway.com. Even though we only have our meetings once a year, our website is a great way to carry on conversations amongst members and receive valuable e-automate information year round. Digital Gateway values your opinions and appreciates the time and resources we put into attending this meeting and sharing our opinions. Thanks again to those who attended in October and we hope to see you all once again in 2009. Oh and one last thing, I learned long ago that repetition is one of the best ways to learn, so once again, here's my plug for the EUG website http://eug.digitalgateway.com. If you have any newsletter questions or comments, please e-mail Ashley at amurray@digitalgateway.com. Your feedback is crucial in our efforts to increase the value of this newsletter. Please feel free to send opinions of what topics or issues you would like addressed in the future. At Digital Gateway, your input matters. Let your voice be heard!